The T-A-Line system is for use with filtered factory airline supplies and delivers air efficiently and safely to the user. 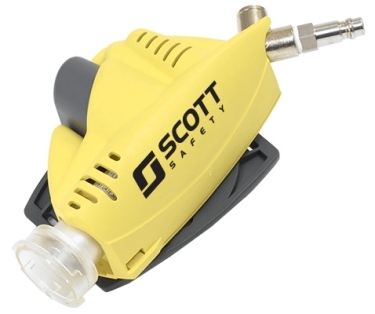 It features an auxiliary air outlet for use with air powered tools. The regulator compensates for variable pressure to guarantee the wearer sufficient air flow. The in built indicator, which also acts as a silencer, visually warns the user of an oil contaminated air supply. A warning whistle informs of low pressure and flow below the manufacturer's minimum. The T-A-Line is fully compatible with the AFU300 and AFU600 Airline Filtration Units.